It will also be very useful. 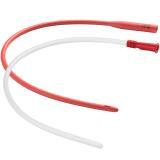 This esophageal tube has the correct rigidity to pass easily yet it has enough softness not to cause injury. Also in my opinion it is the correct length to ensure it is in the core place. Tubes are about useless because they are like a wet noodle. I’ve used these tubes along with a 60 or 140cc catheter syringe for many years to tube feed newborn lambs. An essential for lambing time. I’ve saved a lot of lambs with this combination. I had the clear to see if there were clogs, but picked up the red tubing as it is better in the cold weather and more flexible.